Culture shock is one big things people talk about when it comes to moving abroad, but the less talked about, and just as relevant, shock is reverse culture shock. In other words, the shock that you feel when assimilating back to your home country. I’m not exactly home yet. I’m currently bumming around my dad’s house in the UK before my final move back to California, and while I don’t necessarily consider the UK home, I have enough ties to the country to make it feel somewhat like a second home. All of this is to say that while I’ve experienced some reverse culture shock in the UK, I’m sure that I’ll experience more when I return home to Los Angeles, and still more once I start my new job in September. To give you a slightly better idea of what reverse culture shock can look like, I’ve included a picture that I stole from the U.S.-Norway Fulbright Commission. 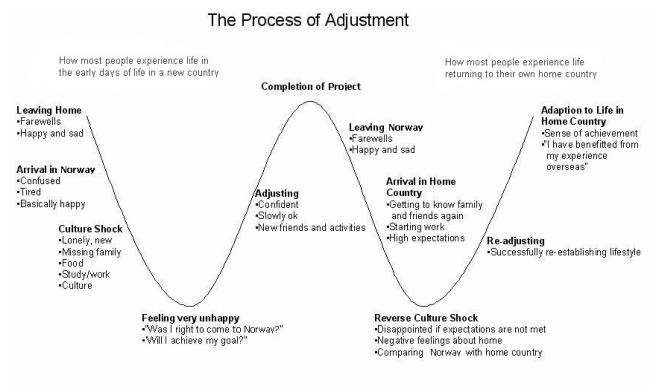 I’ve been told that it’s generally called the W curve of cultural adjustment, and have definitely felt a number of the feelings on the chart at various points before, during, and after my Fulbright. One of my first reactions when being driven home from the airport was “Why is there so much brick everywhere?” In the little village where my Dad is based, most homes are made of brick and brick is a common building material. It just looks wrong. Although I myself lived in brick housing for my Fulbright, I would say that the majority of Trondheim is made up of wood. Wood is the dominant building material, especially in smaller towns in Norway. In the UK it’s pretty rare to see a house made completely of wood, and its absence something that I’m adjusting to. Why Are There So Many People? When I tell people that I lived in Trondheim for a year, they tend to think that’s code for living in a mountain cave and having a troll for a neighbor. Trondheim is far from being in the middle of nowhere, and it is Norway’s third biggest city. That being said, the population is tiny. A 2012 survey registered the population as being 178,021 people. While I find my Dad’s village manageable (it’s so small that there isn’t even a proper grocery store), I do find larger cities, such as London, to be almost completely overwhelming, specifically when it comes to the number of people that live there. One great benefit of being home is being more immersed in an establish social network. I don’t have a particularly strong network of friends in the UK, but the relationships that I do have have been established for much longer, and in many cases are much stronger, than the ones that I had in Norway. It’s also been great to see my family again, and to catch up with them since I last saw them. The biggest shock by far is the fact that I can now understand everything. I didn’t realize exactly how much I’d tuned out of my daily surroundings until I started to feel a bit overwhelmed by simply walking around. I can read advertisements, newspapers, and can even understand my Spotify ads! Out of all of this, I have to say that the thing that startles me most is the ability to inadvertently eavesdrop on people. Because everyone would generally switch to English when talking to me, it’s a bit of a shock to hear English constantly and to realize that it’s not always aimed at me.